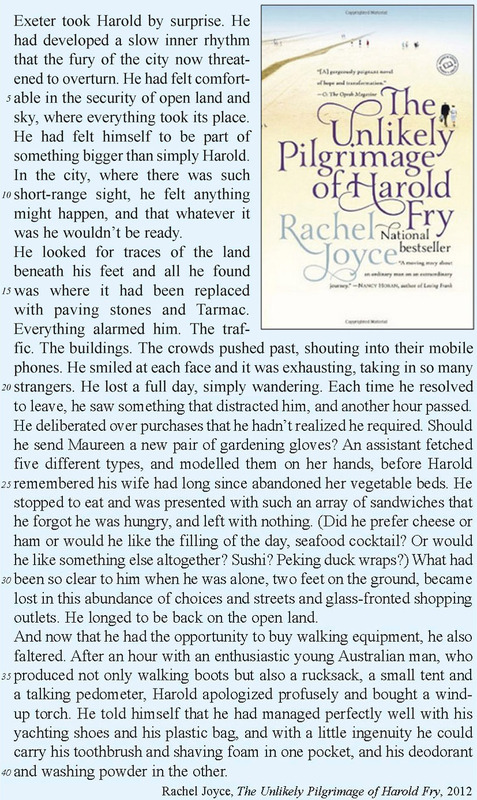 Questions sur "Born to Walk" et "The Unlikely Pilgrimage of Harold Fry", à propos de la marche. 1 Doc. 1 et 2. What activity do Harold Fry and Matt Green have in common? Write down the answer onto your paper. 2 Doc. 1. a. Fill in the gaps with words from the list below. Copy the paragraph onto your paper. The author, ……………, changed his life. He stopped …………… and started …………… and …………… about other people’s personal experiences. One of his examples is about ……………, who also decided to change his life. b. Why did Matt Green make that decision? (2 reasons). Find a quotation for each reason. 3 Doc. 1. a. Look at the map and write down the different steps of Matt Green’s trip in chronological order. Associate each step with the appropriate letter. b. What did Matt do before leaving? Copy the right elements onto your paper. Copy the appropriate slogan onto your paper. 2) To be happy, plan your future step by step. 4) Enjoy the present, let life surprise you. 4 Doc. 1. a. 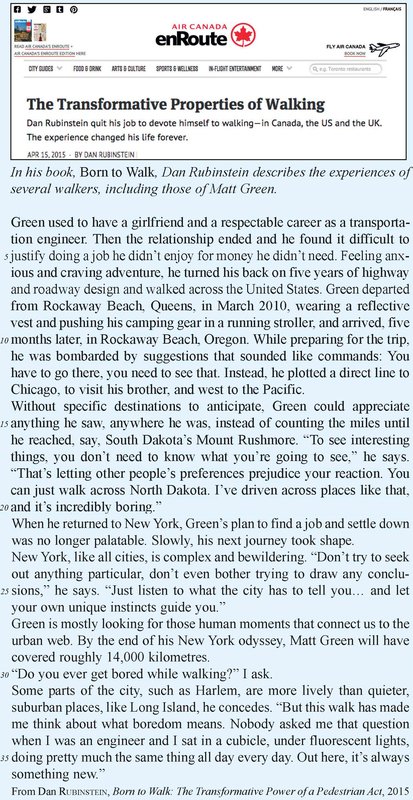 “When he returned to NY” (l. 21), what did Matt Green decide to do? Copy the right answers onto your paper. 1) find a respectable, well-paid job. 4) become a municipal tour guide. 2) rediscover New York City. 5) stay there and keep walking. 3) start a stable family with his partner. 6) leave and explore the country. b. What does he realise about his life before and his life now? Choose the right adjectives to complete the sentences. 5 Doc. 1. Which movement best represents where Harold comes from and where he is now? Choose the right itinerary and write it down onto your paper. 6 Doc. 2. Choose the adjectives which best describe his feelings towards the places and pick out 1 quotation to justify each answer. Copy your answers onto your paper. 7 Doc. 2. a. Answer the questions by quoting the text. Copy your answers onto your paper. 2) What did he finally buy? b. What is Harold’s main difficulty in the shops? Answer in your own words. 8 Doc. 1. et 2. Answer the following questions about Matt Green and Harold Fry and justify in your own words. Write down the answers onto your paper. a. Do they share the same opinion about the city? b. Do they share the same opinion about following people’s advice? c. Do they share the same opinion about living a simple life? Sujets au choix sur les récentes vacances ou sur des vacances à planifier avec un ami.